View More In Manual Espresso Machines. 1. Use tools to install the faucet. 3. Do not hurt your hand while opening the tap. - Put the faucet and connector at the same level when install. It must be screwed on tightly. 5. Install the faucet into keg. 1. Put the coffee concentrate and water into the keg. 3. Put the nitrogen capsules in nitrogen jacket. 4. Screwing the nitrogen jacket. It starts working when you hear a hissing noise. 5. Shake the keg. Then, put it in refrigerator for more than 1 hour. 6. Enjoy your cold coffee! *Note: Please do not worry if you find the faucet is dripping when you close it. It is because there is some residual. 1. Fill keg with hot water. - Repeat 3 times. 2. Rinse the hose with hot water. 3. Fill with hot water and 1 tablespoon baking soda or powdered brewery wash into coffee pot. - Shake until water runs from top, and leave it for 10 minutes. 4. Rinse the faucet. - Please turn on the faucet. 5. Use the cleaning brush to clean the coffee pot. 2L keg can be poured into 1.5L coffee because nitrogen is insoluble in water. Please do not fill the keg. ♥[EAST TO ASSEMBLE]: Easy to Installation - Easy to Clean - Easy to Fill - Mini Size Easy to Carry. 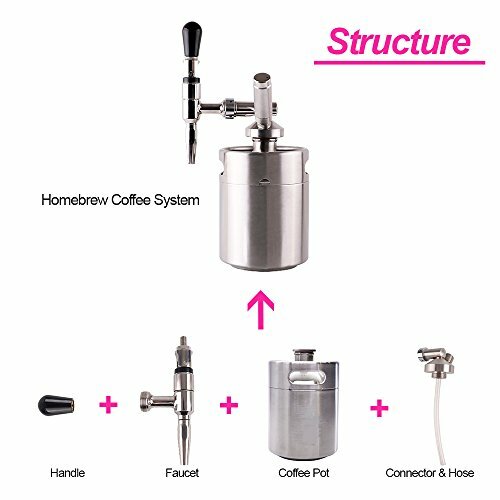 Brew your own exclusive cold coffee at home. ♥[TAKE IT EVERYWHERE]: It is really portable for camping, hiking, picnic, BBQ, party or other outdoor activities with your friends and family. ♥[NITROGEN EFFECT]: The nitrogen effect cuts the acidity that is tied to traditional cold brew, making it easier on the stomach. Take your coffee relationship to the next level. ♥[THE PERFECT GIFT]: It's perfectly designed for coffee lovers, holiday gift, Christmas gift. ♥[WARRANTY]: We stand behind our product and quality by offering the Amazon guaranteed 30 days return waranty. If you didn't like what you have received, return for a replacement or money back within 30 days. If you have any questions about this product by Lymor, contact us by completing and submitting the form below. If you are looking for a specif part number, please include it with your message.